This new report from Greenwich Associates discusses how the adoption of advanced technology solutions is leveling the playing field for middle market fixed income dealers and fostering greater levels of competition. Today, a dramatic increase in technology available from third-party providers has started to change the landscape. 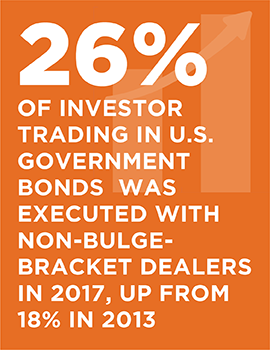 Everything from trading technology to risk tech can now be purchased and customized without the need for a large IT team, allowing regional and middle-market dealers to auto-quote the prices of fixed income instruments with the best of them. As a result, the fortunes of these smaller dealers have improved and they are now competing for the same clients and the same trades as the biggest dealers in the world. Greenwich Associates is the leading global provider of market intelligence and advisory services to the financial services industry. Greenwich Associates specializes in providing fact-based insights and practical recommendations to improve business results. Its insights and advice are based on business expertise and research conducted with influential buyers of financials services. These buyers include fund managers, hedge funds, pension funds, endowments, large corporations, small & mid-sized businesses, and consumers. Complete the form below to download this complimentary Analyst Report.